Continuing the measures on counteraction to illegal activities at the state border within the framework of the joint special operation” Border 2018″, the border guards together with the SSU staff and National Police prevented the attempts of illegal movement of persons across the state border. Due to the exchange of information between law enforcement officers it was managed to track a group of foreigners who were sent by car in the direction of the border. The vehicle driven by 42-year-old resident of Bukovyn was stopped by the law enforcers on the outskirts of the village Zavoloka, Storozhynetskyi district. Four undocumented citizens of Bangladesh were inside the car. All detainees were delivered to the Temporary Detention Facility of Chernivtsi Border Detachment. Their further destiny will be decided by the court. This entry was posted in Translated Media-News from Ukraine and tagged Bangladesh, detainees on October 16, 2018 by oksana. 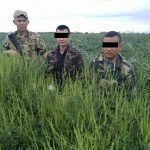 Reaction group of the BD “Sheheni”, Mostyska Detachment, detained three illegal migrants at the approaches to the state border. In the course of verification actions it was established that the seekers of “better life” arrived from Cameroon. Currently, the offenders are detained in the special premise of the Border Unit, where the circumstances of ther illegal trip are investigated. Detainees will have to bear administrative responsibility for the attempt to cross the state border of Ukraine. This entry was posted in Translated Media-News from Ukraine and tagged Cameroon, detainees, illegal migrants, Polish border, state border, Ukraine on August 27, 2018 by oksana. Border detail of the BD “Horonhlab”, Mukachevo Detachment, noticed a man, who with the help of the optical device observed the state border for border duties. During further operatively-search actions the border guards established that the observer was not lone at the border. As it turned out, two more men tried to get illegally to the neighboring Hungary. The border guards detained all three persons. Two of them had no any documents introoducing themselves as the citizen of Vietnam. The man who accompanied the foreigners had the passport of the citizen of Ukraine. In order to clarify all the circumstances of the offense and draw up the administrative reports the offenders were taken to the border units. The further destiny of the detainees and the punishment will be determined by the court. 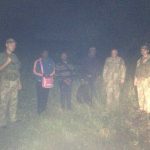 This entry was posted in Translated Media-News from Ukraine and tagged border, border guards, detainees, Ukraine, Vietnam on August 16, 2018 by oksana.